Renee grew up in Rapid River on the Stonington Peninsula. She attended Bay College and went on the Northern Michigan University where she received her Bachelors of Science Degree in Accounting. After graduation she started her career and family in Marquette. She worked at a public accounting firm where she focused on monthly service as well as individual and corporate taxes. After five years, her family made the decision to move to Wisconsin where she decided to change to in house corporate accounting. Over the next 18 years she focused on payroll, 401k administration, audit preparation, reconciliations and preparing financial statements. 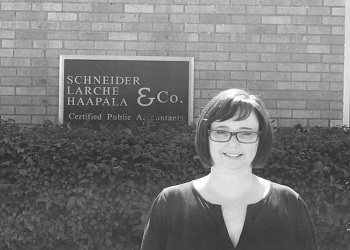 In September 2015, she decided to return home and was hired at Schneider, Larche, Haapala & Co. as an accountant, the same company her mom worked for when she was a child.